Body Mass Index Portable Scale, BMI Portable Scale, Portable Scale, Detecto, DR400-750. 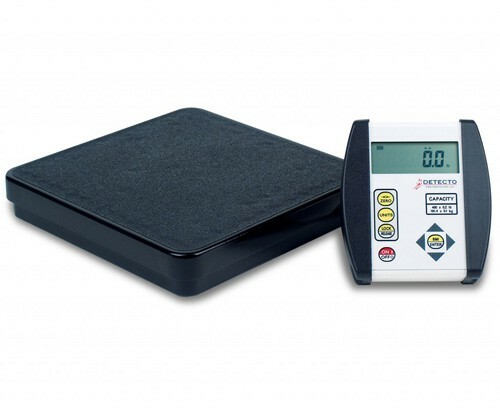 The Body Mass Index Portable Scale, manufactured by Detecto, is a portable two-piece scale. The digital indicator can either be remote or adjacent to the scale. If you choose, you can mount the digital indicator to a horizontal or vertical surface, as it comes with a mounting bracket. The indicator features easily readable LCD digits, choice of units, and a lock/release button for retaining an individual's information after he or she has stepped away from the scale. 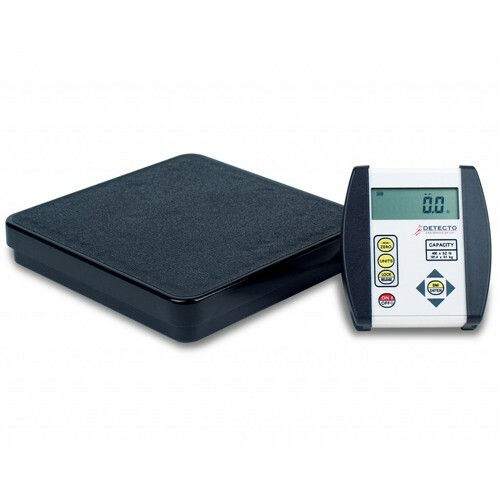 The Body Mass Index Portable Scale calculates an individual's body mass index by simply entering the same individual's height into the indicator. Whether you are looking to maintain weight, gain weight, or lose weight, you can easily track your goals and progress with the Body Mass Index Portable Scale. BMI Height Range: 3-7 ft.
Power: 6 AA batteries (not included) or optional AC adapter. Application: Calculates weight and body mass index.